So many things to comment on! 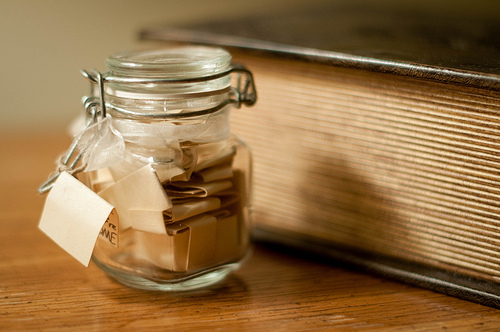 First, I love the idea of the memory jar. I have been struggling to figure out a fast and easy way to note down memories, mostly related to my young family. I am lousy at keeping a journal, and my goal of writing each child a letter at Christmas got pushed back to New Year’s, and here it is Jan. 17th and still not done. This is the perfect solution! I, too, am trying to practice more Random Acts of Kindness. I recently bought the book “29 Gifts” by Cami Walker. It’s all about how giving simple gifts every day can change your perspective and bring joy to your life. It’s that positive karma that I recently discussed on The Kids Yoga Resource (http://thekidsyogaresource.com//2010/01/karma-kids-and-the-golden-rule.html). I sent a copy to a family member who struggles with depression. Your blog is amazing and I love all of your ideas for yoga class, as well as your perspective on lifestyle and lessons for all. Keep up the good work! I look forward to following you in 2010!